The story and history of Saint Nicholas of Tolentino. Born in answer to the prayer of a holy mother, and vowed before his birth to the service of God, Nicholas never lost his baptismal innocence. His austerities were conspicuous even in the austere Order - the Hermits of St. Augustine - to which he belonged, and to the remonstrances which were made by his superiors he only replied, "How can I be said to fast, while every morning at the altar I receive my God?" He conceived an ardent charity for the Holy Souls, so near and yet so far from their Saviour; and often after his Mass it was revealed to him that the souls for whom he had offered the Holy Sacrifice had been admitted to the presence of God. Amidst his loving labors for God and man, he was haunted by fear of his own sinfulness. "The heavens," said he, "are not pure in the sight of Him Whom I serve; how then shall I, a sinful man, stand before Him?" As he pondered on these things, Mary, the Queen of all Saints, appeared before him. "Fear not, Nicholas," she said, "all is well with you: my Son bears you in His Heart, and I am your protection." Then his soul was at rest; and he heard, we are told, the songs which the angels sing in the presence of their Lord. 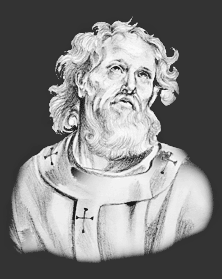 He died September 10, 1310. The Feast Day of Saint Nicholas of Tolentino is September 10. The origin of Feast Days: most saints have specially designated feast days and are associated with a specific day of the year and these are referred to as the saint's feast day. The feast days first arose from the very early Christian custom of the annual commemoration of martyrs on the dates of their deaths at the same time celebrating their birth into heaven.